A hidden gem in the heart of Duxbury, this 9+ acre private oasis boasts natural wildlife and scenery at your fingertips with a unique architectural experience. Drive down your private lane... enter a waterfront property with, two docks, bay and ocean views and a potentially buildable lot to create your perfect family compound. 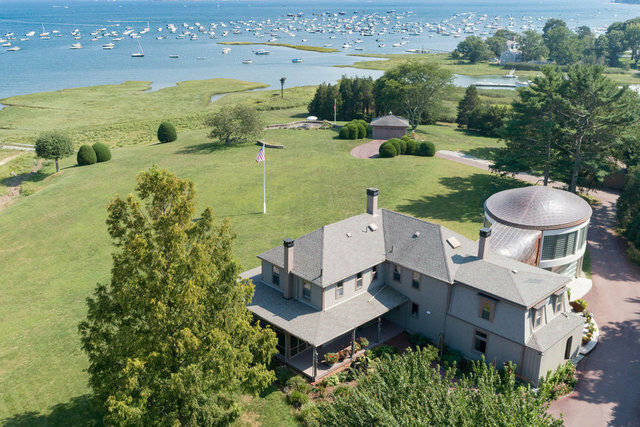 One of the last waterfront properties with this much land offered in Duxbury, you can create your summer hideaway or make a year round escape from the hustle and bustle of city life. A grand cottage dating back to 1895 and relocated to it's current location this lovingly maintained estate with cedar columned porch and classic details exudes timeless living. The Main House leads into a grand rotunda designed as an artist studio or whatever your imagination desires that has walls of glass and was inspired by an Italian church from the countryside perfect for spectacular sunrises. Purposefully planned gardens complete this magical estate, come and explore the relaxed grandeur.